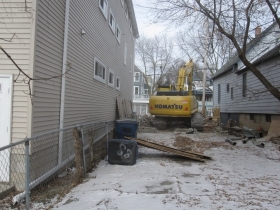 First home to be razed in 2018, on E. Kane Pl., getting replaced by three-story duplex. 1159 E. Kane Pl. Rendering. Rendering by Michael J. Doll. 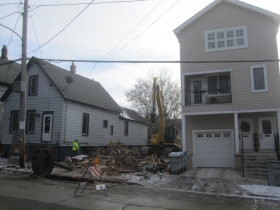 An 1880s single family cottage with 1,056 square feet of finished living space was among the first homes to be razed in the City of Milwaukee in 2018. By the morning of January 3rd it was gone. The building, at 1159 E. Kane Pl., is to be replaced by a 2,800-square-foot duplex residence designed by architect Michael J. Doll, AIA, of the Studio M Doll firm of Cedarburg. The three-story structure will be 35 feet tall, and have a first floor consisting of 870 square feet, including a garage space. The property was bought for $90,000 on October 14th, 2016 by Ricardo S. Mastrolia, M.D., a Maternal Fetal Medicine Specialist affiliated with Aurora Health Care, and his wife Justine M. Mastrolia. (According to city permit files, the doctor and his wife live in a 4,000-square-foot single-family home in the Town of Cedarburg.) The building permit for their new investment was issued in March, 2017. The property had been assessed a valuation of $30,100 for its 25-foot by 101-foot lot ($11.92/ square foot), and $67,000 for the now-demolished building, for a total assessment of $97,000. 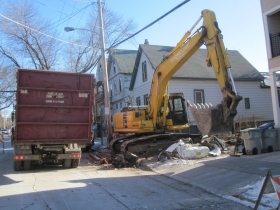 The home had been vacant, and had been a problem property in the neighborhood for some years. The now-gone structure was 18-1/2 feet wide, and was set back a mere seven feet from the sidewalk. It was located five feet from the building to the east, and a mere 1-1/2 feet from its western neighbor. The building to the west, now a rental duplex, was once also a single-family home, built in 1885, and remodelled into a $442,800 duplex in 2013-2016. It is also owned by the Mastrolias. It’s a rental property for a doctor/developer. 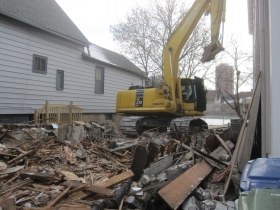 He bought the single family home to tear down and rid the neighborhood of a problem property (social dedication) and with interest as the neighboring property owner. I had to max out the lot with building as he wanted certain size units to attract a rental subgroup. So it ended up to be a 3 story 2 family home with some uniqueness of open entry stairway and south side (solar) porches. I think it turned out pretty well all things considered. The owner had a traditional slant and I pressed for something modern so it is a happy compromise without breaking the budget. There’s a nice rhythm to the fenestration and the siding is unique assuming the owner and builder don’t change it. 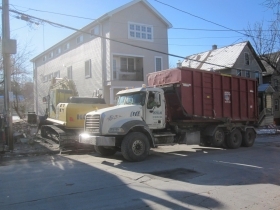 Note also how a parking space and garage are tucked under and into the building – not so easy to do with a narrow lot set up for a small single family home. I like it and believe it’s a good addition to the neighborhood. Not extravagant but effective. 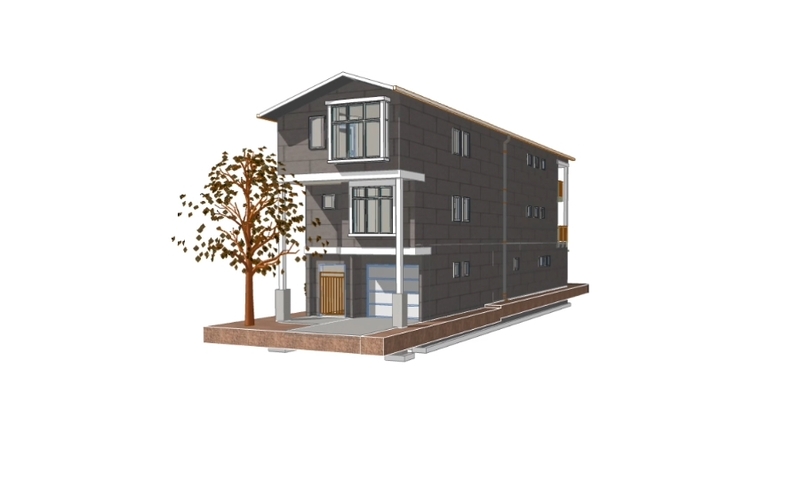 Rendering of 1159 E. Kane Pl. From before 1930 to early in this century, the home was owned and occupied by members of the Sakowski family, in what was then an isolated and densely packed Polish neighborhood. In 1930 Stanley Sakowski, a carman, lived in the tiny home with his wife Mary and three children, including Catherine, a student, and sons Ralph and Roman, both shoeworkers. Neighboring families next door and across the street included those named Bychynkowski, Wojciechkowski, Ostrowski and Gromowski. The home’s pre-1931 address was 1118-North Water St. During the citywide address change of that year, North Water St. became E. Kane Pl. Due to a geographic quirk, thanks to the river’s bend here, addresses on the north side of the street were odd numbered, an anomaly that has since been remedied, with the odd numbers now on the south side of the street, as is and was customary. In 1946, the home was valued at $800 for the land, and $1,000 for the cottage, for a total assessed valuation of $1,800. In October, 1950, Roman C. Sakowski [1912-1979] and his wife Leona bought the home he grew up in from his mother Mary, taking out a $2,500 mortgage with the People’s Savings and Loan Association, located just up the street at 1201 E. Brady St., (most recently Cempazuchi restaurant, and soon to be Kompali, an offshoot of Bay View‘s C-viche). Roman Sakowski, by then a foreman, received an order from the Department of Building Inspection and Safety Engineering in March 1958. Subject: One-story frame shed located rear of 1159 East Kane Place, Milwaukee. A recent inspection of the above building discloses an unsafe and dilapidated condition making it unfit for occupancy or use. The wood foundation sills and posts are decayed causing the walls and roof to be out of plumb or level. This building is unsafe, insanitary, a fire hazard and is to be torn down and removed. Sakowski complied with the order. No trace of the shed foundations has yet been unearthed by the excavator on site, who is working, of necessity, from the front to the rear of the property. In February, 1963, Sakowski applied to the city for permission to put an 18-foot-by-14-foot addition to the rear of the residence, with a basement crawl space beneath. The first floor, which originally had three rooms (and apparently a bath), now held four rooms and a bath. The second floor remained with one room, accessed by a scuttle — that is, a hole in the ceiling with a drop-down ladder. In 1963 the old asphalt siding was removed and replaced with foil-backed aluminum siding. In 1981 Leona Sakowski had some electrical work done at the home, where she continued to live until at least 1990. At the end of December, 2017, contractors removed the aluminum siding in preparation for the demolition, revealing the original weather-beaten wooden exterior of the home, which had not seen a paintbrush for many decades before it was covered up in 1936. The “East Village,” as the area between E. Brady St. and the Milwaukee River is informally known, was originally constructed of modest homes like the now-gone cottage. Even among its peers it was unimpressive, since many of them had long since graduated to becoming genuine Polish Flats, first jacked up, and then with an above-ground foundation built beneath. The densely packed neighborhood was filled by a succession of immigrants, or occupied by single families like the Sakowskis for generations. By the 1960s the demographics had changed, and most of the riverfront homes in the 1200-1300 block of E. Kane Pl. were demolished for the construction of the Riverview Tower, owned by the Housing Authority of the City of Milwaukee. The homes behind the cottage were demolished in the 1930s to provide recreational space for one of the state’s most crowded neighborhoods, and is now Pulaski Playground. 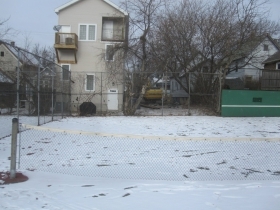 This accounts for why there is a tennis court to the south of the property, and an unattractive chain link fence bordering it. There were even plans entertained in the 1960s to tear down all structures on both sides of the street. In a 1963 note in the building file, an inspector writes: “NOTE This building may be in development area — check!” The inspector checked, and then crossed through his note. The catalyst for neighborhood change, and one which has truly rendered the neighborhood a development area, was the construction a decade ago of Kane Commons, which added three luxury units along the river, buttressed by courtyard and streetside residences, including one across the street at 1170, and built in 2016. We covered its construction at Urban Milwaukee. Last July we reported about two single-family homes under construction on the river side in the story, “The Land of Single Family Homes,” which provides additional information that might be of interest to the reader. The worst bits of modern and traditional design married to cheap materials. And how high will the rent be here in gentrification land? Agreed Tim and Lisa. We can do much much better than this. …and once it is built the property taxes will go up to about $12,000 a year. I would love to buy a lot in the city or knock down a house and build my own. But to be socked with a huge property tax bill is the biggest deterrent. Then convince the State to allow the City to diversify it’s revenue streams so it isn’t so reliant on property taxes. Then convince the State to allow the City to diversify its revenue streams so it isn’t so reliant on property taxes.